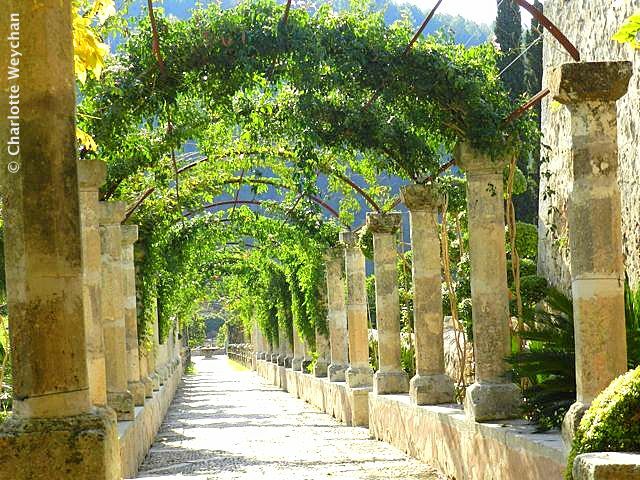 It would be easy to miss the Jardines de Alfabia in Mallorca, because they are sited right at the entrance to the tunnel that connects Palma to the sleepy town of Soller on the North West corner of the island. 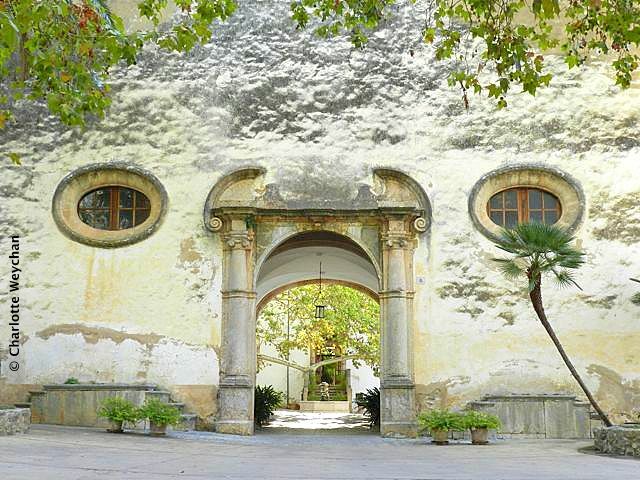 Historic references indicate that this was once the home of the Arabic Viceroy of the island. 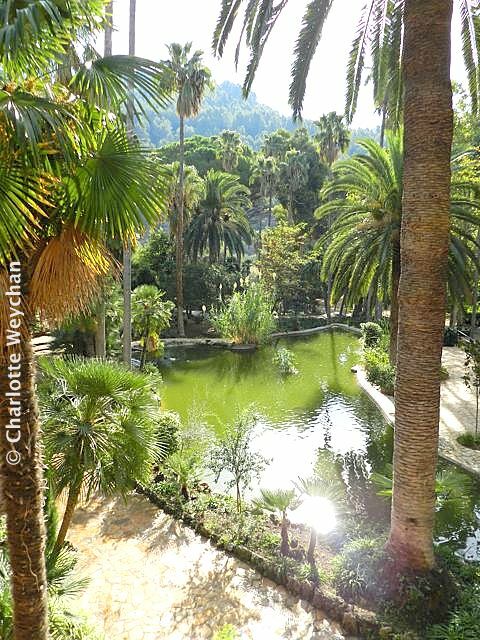 But they are certainly a fine example of Moorish garden design, where the emphasis is on water and irrigation and are well worth stopping in to see if you're passing this way and want an excursion that doesn't include sea, sand or water sports. These charming gardens are being restored - very slowly - and with temperatures hovering around the 30C mark even at the beginning of October, you see the gardeners at work with a decidedly "manana" approach. 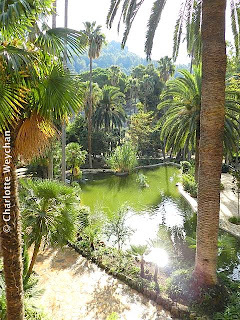 These gardens are a rare remnant of Moorish civilisation on the island, and if it's gardens you're after during your Balearic stay, they provide a much better alternative to the rather disappointing Botanic Garden at Soller. 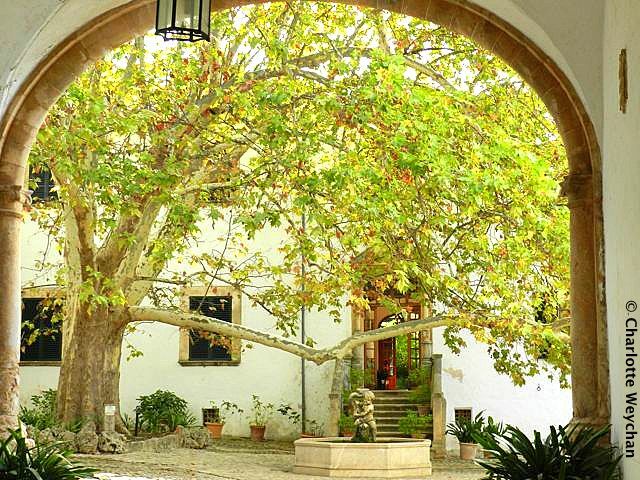 You access the gardens through a fine avenue of plane trees and head towards the main facade of the house (top) before veering off to the left and entering a stepped walled garden, with compartmentalised planting and fine examples of Moorish irrigation channels. 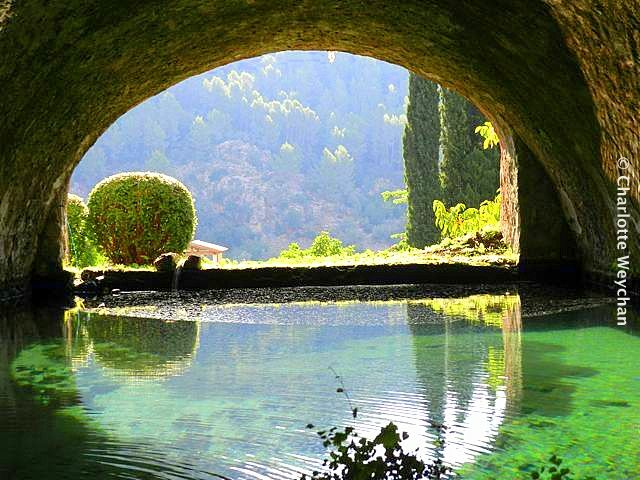 To the side of this garden, you'll get a fine view of the Tramuntana mountains, across the water cistern (above), which supplies the water to the pergola. The pergola (above) has 72 columns, and at the lower end, the stone walls are adorned with 24 stone hydras (12 at each side), which are the source of the water jets that once immortalised this garden. But they weren't working when I visited and my limited Spanish was insufficient to find out when they do, although I suspect that a summer of severe drought may well be the explanation. From the pergola, you can access the later additions to the garden at the rear of the house. It is here that you find the arbor and the nineteenth-century garden that clearly shows the influence of Italian design, with the large water pools (left) and English design with the planting - designed to give shade during the heat of the day. What is apparent at Alfabia is that there's a substantial investment in replanting, although it's clearly with a view to making the gardens more attractive, rather than restoring them to their original planting design. There are a huge number of new cycads and other architectural plants which will eventually give structure to the garden. Local friends who visited with me were amazed by the progress that's been made here in the last five years. It's a charming place and very restful, and there's certainly a fine collection of local palms. Open Monday to Saturday (9.30-18.30), from 1st April to 31st October. Entry is 6.50 Euros for adults. Certainly worth a detour and a good place to catch your breath and retreat from the heat for an hour or two. Thanks for the memories. Have not thought of Mallorca in a while. I loved it and your photos capture how beautiful it is. I used to live in Seville and we would run over there sometimes on the weekends. Beautiful!!! What a beautifull garden !!!! An absolute pleasure! Living in Puerto Rico without one single garden worthy of mentioning, this is a lesson of what vision, a whole sense of what composition in gardening provides to those who practice the trade critically. All your posts are always interesting and colorful. I read them with pleasure. 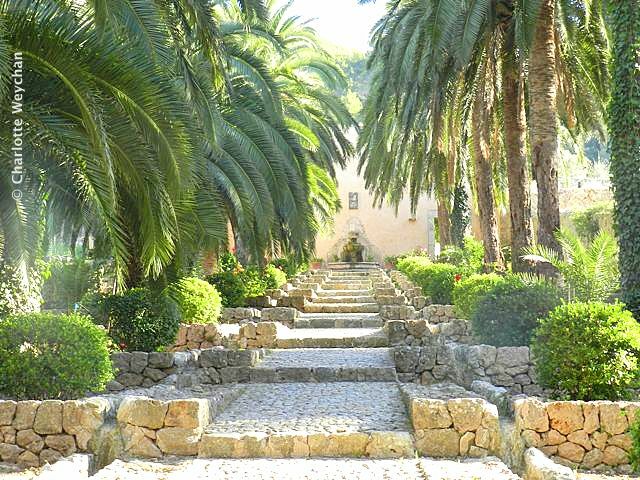 This garden in Mallorca is very beautiful. And photos are amazing ! I very liked the photo with water cistern. It is simply the paradise so it is beautiful! Thanks for letting me know about this, really looking forward to visiting it!